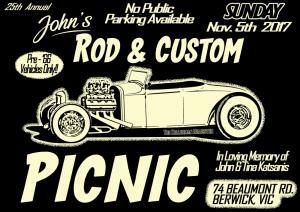 From this point forward we have a theme, its no longer just The John’s Rod & Custom Picnic it’s the LIVING HISTORY Rod & Custom Picnic! Here’s the deal. We all know there are scads of genuinely historical hot rods & customs out there under piles of other stuff in the back corners of dark sheds and garages. So I’m gunna challenge you all to drag those old things out, clean ‘em up and bring ‘em along to show ‘em off to others who may have heard the stories and legends but never seen those neat old cars face to face. We don’t normally do judged awards at The Picnic, but as you know we do give away a few trophies. Usually to cars selected by enthusiast like us all, just because they are kool. That’s not going to change, there’ll still be awards for those cars and other things, but we want to go one further. So here’s what we will do. There will be a special trophy and CASH award for the kewlest car with a historical past & story to tell. That might just be the incentive required to get some of those neat old Kustom and Hot Rods to show there faces in public one more time, we will reserve a special parking area for these old things, just to make sure they stand out from the regular crowd of rods, customs and kustom sickles. And kids, no not you, the ones so young they don’t yet have a full sized car. 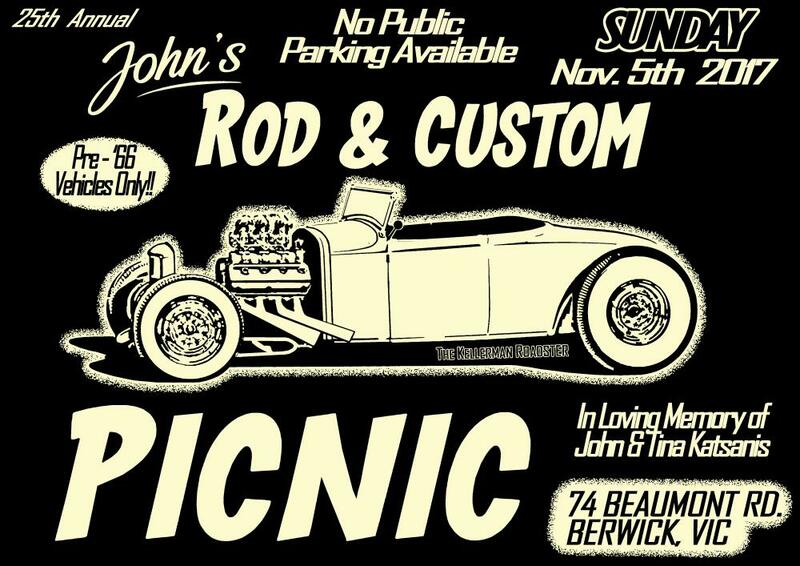 Don’t forget to bring along your kustom mini rods and bikes, and of course we are also planning a large model car show with for best Hot Rod model, Kustom model and Traditional Rod or Kustom model, so break out the plastic, paints and glue, then get building, so you’re in with a good chance. There’ll also be a fine exhibition of Kustom Kulture. Sorry there is no public parking available.